Emory is one of several major research universities in the U.S. In its 2009 edition, U.S. News & World Report ranked the university&apos;s undergraduate program 18th among national universities, while ranking the medical, law, and business programs among the top 25 in the country. To create a graphic design face lift and navigation system. The goal is to develop an interface that more strongly represents the real Emory as world-class, top 20 research university situated in a stately suburb near Atlanta&apos;s hub. Emory&apos;s web site was in an aging template from the 90&apos;s. The web site had grown past the scaling abilities of the present navigation scheme so the the site had resorted to navigation through series of landing pages with columns of in-line links. The resulting complication was much vertical drilling in search of content and heavy reliance on an alphabetical "Site Index" page that was frequently out of date. This lack of good organization and navigation led to many splinter organization web sites with independent graphics and navigation schemes. Internal site users became accustomed to this, but external visitors were often confused and unable to find the content they searched for. This project was the first in many years to consolidate the web content under one design and navigation system. Some content reorganization could take place, but Emory project sponsors wanted to take steps in a positive direction for the external site visitors without alienating the internal culture by totally reorganizing the content. The project concept was to make a significant successful impact and secure additional funding for future development of Emory&apos;s web systems. Many of these future developments were dubbed "Phase II" items and arcithecture was included into this Phase I project that would accomodate for the development and scale of the Phase II projects. One of these Phase II projects was a text-based site for Section 508 / ADA Compliance. The Public Affairs office wanted the design to follow a growing family of design that was in place through several other XI projects at Emory namely Woodruff Health Sciences Center and The Rollins School of Public Health. The design was created featuring similar lines and angles, photographic features, and dynamic menu systems. Several small data systems were needed and these needs were solved with XML solutions. XML provides a simple and scaleable solution that can be easily shared with other entities at Emory. Some of these data solutions were also provided in RSS formats for those with RSS readers. 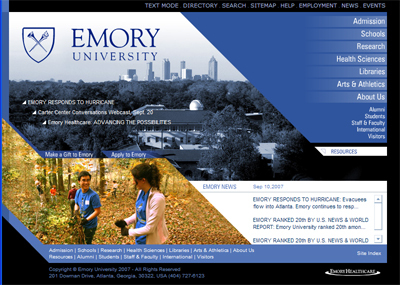 XI accommodated the need for a text-based web site in a way that allowed Emory to maintain content for both the graphics and text site in only one place. This is unusual in the industry as most text sites are an entirely different web site that is separately maintained. Emory&apos;s web site gets volumes of web traffic and they are not much concerned about search engine optimization (SEO) for the sake of drawing traffic into their site. They are concerned though about visitors being able to find their desired content quickly. SEO takes on a different meaning for this client as it will help search engines properly index their web site and draw visitors directly to deeper content. The web site is developed with SEO features in mind. All meta tagging is accomplished dynamically resulting in ease of maintenance. The new site was launched on May 17, 2005. The new site design was very progressive as planned and was well received by students, prospective students, and other external site visitors that the Public Affairs office wanted to reach with this project. Feature photography focused on the Emory campus and Life at Emory allowing webmasters to easily change out the photography as needed. Post-launch surveys showed that the younger student demographic was very pleased with the progressive changes. Some of the internal users needed a little help finding things that were moved around - although this was mostly changes associated with moving toward a structured navigation system rather than simple landing pages. Global navigation is consistent throughout the web site and is accomplished using dynamic flash. This helps the visitors locate content almost immediately with very little drilling needed. Additionally a dynamic sitemap page lists every page of the web site down to the fourth level of navigation for those that want to see the overall organizational view of the site. Search functions are accomplished in cooperation with Google for accurate results. The site is now easily maintained and Emory is able to add pages and sections as needed. The site architecture scales well. The template based system is stable and does not break down inadvertently on obscure pages. Emory’s Web site has undergone a facelift. The redesign was headed up by John Mills, executive web producer in the office of University Marketing Communications, who said the intent was to make the website more usable, more appealing and more up-to-date. The old design served well for more than five years, which is ancient as Web sites go. The new site, created by XI Interactive will better expose the wealth of resources available through Emory’s Web. The goal was to develop an interface that more strongly represents the "real Emory"—a world-class, top 20 research university situated in a stately suburb near Atlanta&apos;s hub. In the last few decades, Emory really has risen to become an international destination for the best scholars, researchers, teachers, staff and health care professionals, but Emory hasn&apos;t had the benefit of many more decades—hundreds of years in some cases—that Ivy League schools have had to market themselves as world-class institutions. Now more than ever, Emory deserves a Web site that&apos;s as good as, and hopefully better than, our peer institutions&apos; sites. Emory&apos;s new look needed to reflect those realities, and at the same time point Web users intuitively and quickly to information. It also needed to fit into a growing family of designs already established by the Woodruff Health Sciences Center site and the School of Public Health site, both created by XI Interactive. Toward those goals, the home pages now provide a simplified navigation structure. The confusing clutter of links on the old site has been consolidated into Flash-based "flyout" menus that contain most of the same direct links as before. The links on the home pages are organized by utility, topic and audience, independent of the University&apos;s internal organization. Most visitors don&apos;t know and don’t care what division of the University their resource falls under. They just want the information, and they want it five minutes ago. However they choose to look for it, we want to make sure they can find that information. The second-tier pages also carry all the same “global” navigation as the home page, making it possible to jump easily between major sections without returning to the home page. A search engine and site map ensure multiple ways of finding nearly anything, anywhere on Emory&apos;s Web. While transparent to users, the technical underpinnings have changed radically, too. XML paired with ColdFusion now builds pages "on-the-fly" as they are viewed, and keeps separate the information, navigation structure and graphic design, allowing webmasters to make sweeping changes quickly. The site is still being refined to meet the needs of various audiences and user bases, and a second phase of development will add better administration and automation tools. This is an excerpt from an article published in the <a href="http://www.emory.edu/EMORY_REPORT/erarchive/2005/June/June_6/website.htm" target="_blank">EMORY REPORT</a>.